In an age of impersonal corporations that expect you to conform to their one-size-fits-all business models, Skybox is here for you. Isn’t that the way it should be? We’re people who listen. We offer options, present solutions, and customize your order to meet your timeline, space restrictions, and cash flow. And since we do it all–manufacture corrugated products, distribute packaging supplies, and deliver on our own trucks–we talk to everyone who touches the box. We’re your one-stop shop for quality control, savings, and personalized customer service. 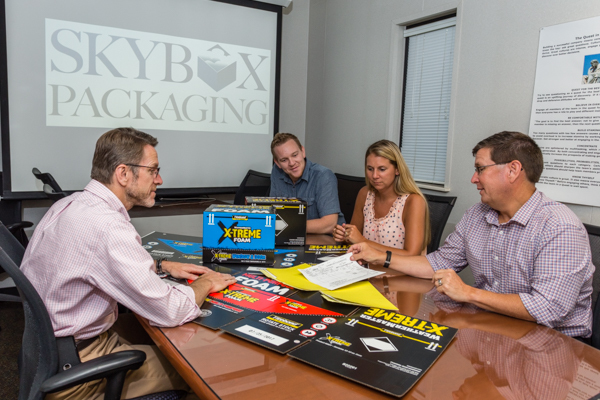 Since 1996, Skybox has made relationships and service our highest priorities. When it comes to efficient, high-quality delivery, can your company afford anything less? You weren't meant to be average. We understand you're looking for a packaging solution that not only meets your needs but provides benefits that your end user can take advantage of. Chat with us today about the type of packaging supplies you're looking for and we'll make it happen.